What Is Knife Honing And Should You Bother Doing It? Home Knife Sharpening What Is Knife Honing And Should You Bother Doing It? Why All The Differing Opinions!? Thanks for joining me at Chef’s Corner, the section of myelectricknifesharpener devoted entirely to knowledge based and “how to” posts (and sometimes recipes!). I really do enjoy writing these posts as it allows me to research a particular topic in detail, and as a result I learn so much more from what I knew to begin with! If you’ve ever searched about knife sharpening online, or watched videos discussing the subject, you will have realized that there are quite a bit of differences in the information presented. Every knife enthusiast will have his/her own opinion/reservation about the subject. There’s nothing wrong with this, but I feel that there should be some consistency maintained across the board. While writing these posts, I research what other people have to say in regards to a certain topic, and share this information along with my own opinion. This to me, I feel is more beneficial to the person seeking information. Do you agree/disagree? Let me know in the comments! For now, lets get back to the subject at hand: what is knife honing. What Knife Honing Is Not! What is knife honing? Before we talk about what it is, let’s talk about what it isn’t. Knife honing is not the same and should not be confused with knife sharpening. Every time you sharpen a knife you remove metal as you pass your blade against the abrasive. The result is a thinner, sharper, more defined cutting edge. When you hone a knife, in the traditional sense, there will be no metal removal. It’s as simple as that. Another point to note: The term honing steel is also incorrectly referred to as sharpening steel, sharpening rod, and sharpening stick. It’s incorrect because it is misleading and wrong! The term sharpening steel implies that this is a tool that can be used to sharpen knives, but it is not. Now that we know what it isn’t, we can talk about what it is. Honing a knife results in simply realigning its edge. That’s really all there is to it. Wikipedia describes it as light maintenance work performed on a blade with less of the effort as required in sharpening. You might ask the question then, why do we need to realign a knife’s edge? This is a great question. 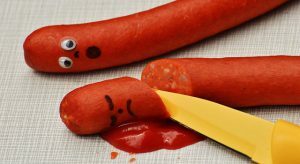 You see every time you use your knife, whether it maybe to cut meats, vegetables, or really anything, you subject the cutting edge to exhaustion. As a result, the knife’s edge becomes misaligned. The very act of cutting into something (anything) disrupts the alignment of your edge! Now you can imagine slicing and dicing up all those vegetables and meats for your meal! Not to mention, all the times you wack your knife on a cutting board…..ouch! Obviously a misaligned edge will not be visible to the naked eye, but if you were to look at a magnified image of your knife you would be able to see it. So now we know what is knife honing and what it is not, fantastic! Let’s address the second part of this post: should you hone your knife, and if so how often? And, how should you hone? Should You Hone Your Knife, And If So How Often? You absolutely should hone your knife. You should think of honing as the maintenance work necessary to ensure the quality and longevity of your knives. As far as I am concerned, the impacts of honing your knives are only positive. Okay, so how often? This is another example of where people tend to have differing opinions and rightfully so (in this case). In my opinion, how often you hone your knives will depend on the frequency of how often you use your knives and for what. If you use your knife to regularly chop up fibrous vegetables and meats, then I would suggest you hone before beginning the activity. However, if you hardly ever use your knife, then you won’t require to hone it as much. Ultimately, the goal is to try and extend the amount of time before you actually need to remove metal and sharpen your knife. How many of you have seen your local butcher running his blade up and down a honing steel so quickly that there hardly seems to be any technique? I’ve noticed this a number of times now. The butcher seems to be so accustomed to the process, that it’s now muscle memory. If you’ve never used a honing steel before, you will want to take your time with it and focus on form. Form takes precedence over speed any day, remember that! Below is a good video (other than the misleading title) explaining the correct way to hone. Credit to Scott Rea. What is knife honing? It’s the process of maintaining your knives so they can remain in tip top condition. Anyone who owns a knife should be honing. There’s a wide array of honing steels you can find online that do not cost much at all. Be sure to do your homework and pick accordingly! Finally, I’d like to know your thoughts on what is knife honing. What does it mean to you and what do you find as a result of either doing or not doing it? Leave me a comment below. Thanks for reading and until next time, ciao! Nice post. I did know that honing was different than sharpening but not too much other than that! I also did not know that honing is important and should be done frequently. Thanks for sharing all this information in a manner that is easy to understand for people who are not all that familiar. The video was nicely explained also (and he has an awesome accent!). Thanks for reading and dropping a comment. It’s always really nice to hear the opinions of my readers as I know how to write/change my next blog posts such that they are easier to understand and provide greater detail at the same time. I hope you found some value from the post and will now start to hone your knives frequently! I recently wrote a post about knife sharpening, so check it out if you’re interested (link below). Cheers! Very interesting! I always thought that honing steel meant sharpening it. Thanks for clearing that up. I have my favorite steel knife but it is old and there are visible notches in the blade. Is there any way to fix this by honing? Is it even worth it? Thanks for reading and commenting on my post. Honing will not fix the chips on your knife, unfortunately. Honing will not remove metal from your steel. If you want to fix the the notches and chips, you need to sharpen your knife. Depending on the extent of the notches and chips, it could take a bit of work to completely get rid of them. If you are uncomfortable with sharpening yourself, you could always provide your knife to a sharpening service located in your city. I would highly recommend that you follow this route. However, if you’re up for the challenge, watch the video below. It does a good job explaining how to get rid of chips by sharpening on two different stones. I hope this helps, and if you require any further clarification please let me know. Cheers! I generally use my knife to cut chicken to prepare a lean meal. I use it about 3 times per week. I typically try to hone my knife prior to at least two of those cutting sessions. I’ve found that it does help quite a bit, not only when cutting chicken (which now is a lot more easier), but also extends the time before I’ll be required to sharpen next. Informative post…..thanks for sharing! Always nice to hear from you! Thanks for reading and leaving a comment. Keep up that honing! Cheers! Thanks for such an informative article! I can certainly see why there is such a wide range of opinions and some conflict regarding this subject. I have to say that my biggest complaint about some brands of knives (even some that are touted as being top quality) is not their ability to cut (they are all sharp, new out of the box), but rather the “balance” of the blade. Some expensive knives are no better designed for balance than the cheap ones. Nothing is more frustrating than a knife that digs to the left or to the right, when most of the time the goal is to cut straight. Is this a problem that can be corrected or somewhat corrected by honing? Thanks for your input and information. Thanks for reading and leaving a comment. Is there a particular knife you are having this issue with (brand, model etc.)? Based on what you are telling me, it seems like your knife edge may have rolled or folded. It’s hard for me to know exactly what may have happened without actually looking at the knife, but seems to be an edge that is hugely misaligned. To give you an idea of what this may look like, click on the link below to check out the picture of a sharp edge and a misaligned one. If this is indeed the case, then I would suggest you try to hone your knife before every use. Do some research and find a good honing steel online (there are plenty available, and you don’t have to pay crazy amounts of money to get a good one!). At the same time, I’d like to ask what you are cutting when this happens, and if you’re using a cutting board also, what is it made of? Please let me know the answers to each of these questions, and I’d be more than happy to help you some more. If you have any picture attachments you’d like to send me, please do so by sending an email to support@myelectricknifesharpener.com Hope to hear from you soon! Cheers and all the best! Thanks for taking an interest in my blade issue. I do agree with you and think that the issue I may be facing is an edge that is misaligned/dull. Since I purchased this knife quite a while ago, unfortunately the brand is not printed on either the handle or the blade. Only one side of the edge is significantly beveled, while the other side is straight up and down. I am only guessing, but it seems like they didn’t properly calculate a balance between the side which has a lot more steel (and weight) on it versus the lighter beveled side. Should I maybe consider replacing it altogether? Nice to hear from you again! I’d like to see some pictures of your knife, so I can try to better help you. Is it possible to send a couple of shots to the email provided earlier? It’s a little hard for me to comment without actually seeing what the blade looks like. I’ll be waiting for your email. Thanks and have a nice day! Cheers! Interesting article….pretty easy to understand the way you have it explained. Looking forward to the next one. I am glad you liked it, Dan. Thanks for reading and leaving a comment. Stay tuned, as there is more to come! I’ve been reading a couple of your posts now, and I wanted to mention how informative and enjoyable your posts are to read. The best part about them is that they’re easy to understand and straight to the point. In an area/subject where lots of stubborn folks tend to have their own opinions about things, I like that you provide/share resources other than your own to better explain the subject. Anyways, great stuff man! It’s comments like yours that inspire me to keep writing these posts. I am pleased that you enjoy reading my stuff, and I hope to put out content more frequently in the near future. Thanks for reading and dropping a comment. Cheers! Good to finally know the difference between honing and sharpening. I knew that sharpening was all about steel removal, but honing was something I was a little unclear about. 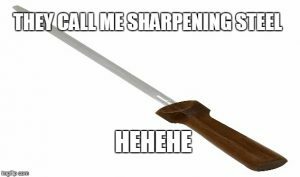 I had a vague idea of it being your regular knife maintenance work……I usually get my chopping knife honed when it feel likes it’s not cutting the vegetables or meat easily. I know it would make sense to do it before each time you use the knife but I never think of doing it before, unless it’s really blunt. Is there a honing steel that you would recommend? Thanks for reading and dropping a comment. There’s tons of really good honing steels available online that are quite reasonably priced in my opinion. Before buying one, I’d consider what length you require the honing steel to be. You have different options available (9”, 10”, 12” etc.). I like the 10” Wusthof Steel. Click here to check it out on amazon. The video does a great job at explaining the technique. Goes to show that speed isn’t everything and you should really slow down until you get the technique down. Thanks for sharing! Cheers Brent! Yes, he does explain the technique pretty well. Slow and steady wins the race! My mom bought me a honing rod this summer and I thought it was a tool to sharpen knives. I used it a few times (incorrectly of course) and stopped using it altogether as it was a hassle. I am glad I knew about your site, and decided to read up on honing while browsing. The video was useful in showing the correct technique. I’ll be taking it out later today when I cook. Thanks for clarifying this! Glad you now know more about honing. Be sure to hone your knives frequently to really reap the benefits! If you have any questions, please let me know. Thanks for reading! Cheers! Cool post. 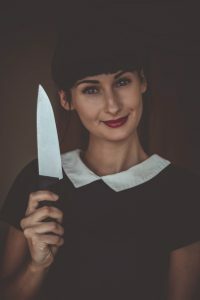 Knife honing, sharpening, and stropping are all terms that can be very confusing for someone who is not familiar with knives and maintaining them. On a side note, do you see yourself posting more about knives (blade shapes, knife material etc.) in the near future? Cheers! Yes it can be confusing, you’re absolutely right! A better understanding of what all three are can help anyone who owns a knife maintain it much better. About making posts more devoted to knives in the future, I don’t think I will simply because I feel there is a ton of information (good and bad) already available out there right now. Blade steel for example is a hugely debated topic which can be pretty subjective at times! If you are looking for specific information, please let me know and I could point you in the right direction or at least what I think is good, solid unbiased information. Send me an email at support@myelectricknifesharpener.com for more discussion. Thanks for reading and have a nice day!